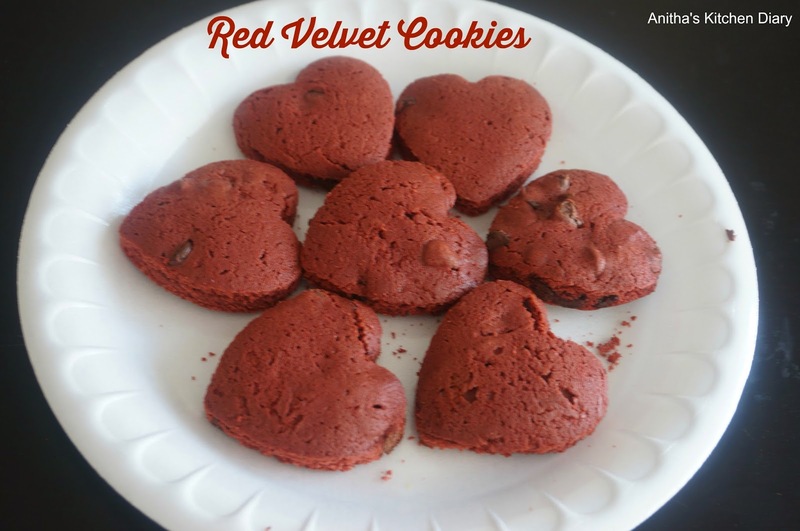 For heart shape food idea, next one is Red Velvet Cookie. Actually the cookies have to be crinkle , i don't know why it didn't. I tried two times still not able to get the result. Combine flour, cocoa powder, baking powder and salt in medium bowl. Beat butter and granulated sugar in large bowl with electric mixer on medium speed until light and fluffy. Add eggs, food color and vanilla; mix well. Gradually beat in flour mixture on low speed until well mixed.Fold in the chocolate chips and Refrigerate for 4 hours. Preheat oven to 350°F. Shape dough into 1-inch balls. Roll in confectioners sugar mixture to completely coat(Optional). Place 2 inches apart onto baking sheets sprayed with no stick cooking spray.